CBR stands for Comic Book RAR. As the title suggests, this format is typically used for comic books, i.e. for the books that come as images. Basically, it’s an archived file that works as a standard RAR document. 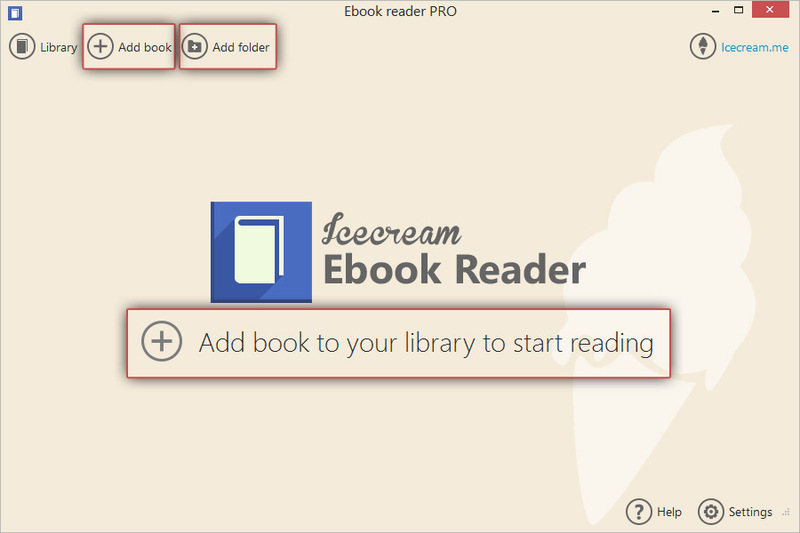 If your computer doesn’t have a CBR reader preinstalled, take a closer look at Icecream Ebook Reader – a simple yet powerful application for reading ebooks, including those that come in CBR format. 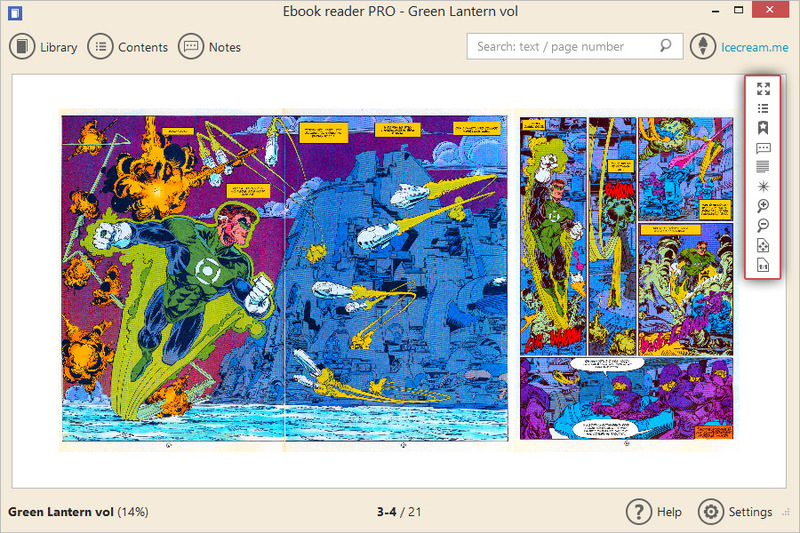 Read this article to learn how to open a CBR file and read comic books on PC with ease. To download Icecream Ebook Reader onto your machine, go ahead and click the button on this site. Save the .exe file and run it to start installing the program (Wizard will aid you with that in case you have a problem). Once it’s fully installed, open it to start working with your CBR files. Click the “Add book to your library to start reading” button in the middle of the main window to add your CBR book to the library. Windows Explorer will help you find it on your hard drive and import it to the program. “Add book” button in the upper left hand side of the program will also open the Explorer to add books one by one. “Add folder” button to the right helps to add ebooks by folders. You can drag and drop the CBR files into the program's window as well. Add as many books as you want and check them out in the Library (press the “Library” button in the upper left corner of the main window). 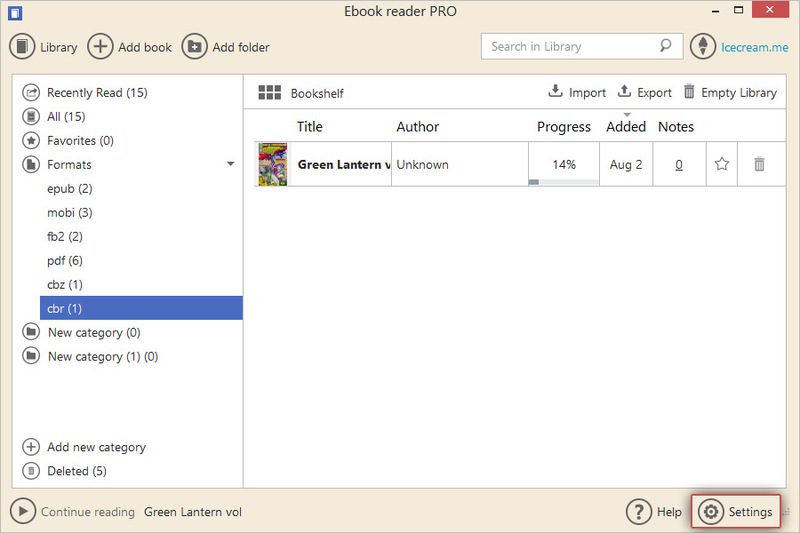 You can view the library in 2 modes: Table view (displays book’s title, author, progress, book's addition to the Library date and notes information in a form of a table) and Bookshelf (displays the books as large thumbnails in a grid form). Click the icon in the upper part of a working area to switch between the modes. To filter your books, use the menu at the left side of the window. It features such filters as “All”, “Recently read”, “Favorites”, and “Format” (which is especially useful to find CBR files). Also, there's an “Add new category” menu option. Click it to add new custom categories to sort out your books in the preferred way. The newly created categories appear right under the list of the formats. In the “Deleted” section of the menu there are the books that were deleted from the Library. You can either restore the books back from this folder to the Library or remove them completely. To open a CBR file, double click a book’s thumbnail. The program will switch to the reading mode immediately. To turn the pages, use the “Left/Right” or “Page Up/Page Down” keys on the keyboard. Сlick the Table of contents icon in the upper left side corner, select the page, and press the “Go to” button or click the needed chapter title to open it. You can also use the navigation scrollbar in the bottom of the opened book to fast scroll the pages of the book. Showing the ebook in its original size. You can see your reading progress on the bottom of the window. Find the “Settings” button in the bottom right corner and click it to open the Settings panel of the ebook reader. You can read more about the options that can be customized here in How to Change Icecream Ebook Reader Settings article.